The MA Irish Traditional Music Performance is a one-year, full-time postgraduate programme designed to provide advanced tuition in the performance of Irish Traditional Music. Instrumental and vocal tuition is enabled by a community of world-renowned traditional performers and tutors. Critical examination of repertoire sources and styles of performance, as well as an examination of modern vocational non-performance skills such as music business and music technology, form an essential part of the programme content. Elective modules allow the student to access the many areas of academic and performance expertise available at the Irish World Academy of Music and Dance. 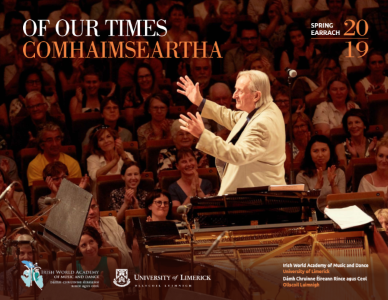 Students of the programme have the opportunity to work with some of the finest and most well known performers in traditional Irish music and related traditions. Weekly classes are provided by our permanent team of highly renowned instrumental tutors. A particular feature of the programme is the number of visiting tutors where students have unparalleled and extensive access to leading international performers. Students have contact with some of the finest and most well known performers in traditional Irish music and related traditions. Weekly classes are provided by our permanent team of instrumental tutors. However, a particular core feature of the programme is the number of visiting tutors to the programme where students have unparalleled, extensive access to the leading performers internationally. Students also have an important say in the choice of tutors who visit in the academic year. Some of our visiting tutors have included Martin Hayes, Tommy Peoples, Frankie Gavin, Kevin Crawford, Matt Molloy, Jean Michelle Veillion, Brian Finnegan, Donal Lunny, Steve Cooney, Mary Bergin, Enda Scahill, Mikey Smith, Ryan Molloy, Matt Cranich, Noel Hill, Charlie Harris, Micheal O Raghallaigh, Dermot Byrne, Karen Tweed, Laoise Kelly, Joe Burke, Kieran Hanrahan, Liam O’Connor, Any Irvine, Roisin White, Niall Vallely, Catherine McEvoy, Nan Tom Teaimín De Búrca, Tony MacMahon, Dave Milligan, Marcus Moloney, Alec Finn and many, many more. Regular tutors include Siobhan Peoples, Eileen O’Brien-Minogue, Derek Hickey, John Carty, Jim Higgins, Niall Keegan, Kieran Munnelly, Majella Bartley, Tommy Fitzharris, Alan Colfer, Tadhg Ó Meachair, Conal O’Kane, Karan Casey, Conor Crimmins, Emily Flack and Alan Reid among others. In this module students create, design and manage their own performance programme under the supervision of the Course Director. To this end students attend instrumental / voice classes with tutors in a variety of teaching contexts, adopted in accordance with the needs of the student and the optimum teaching environment for the tutor. These classes will be masterclass style. As part of this module there is also an emphasis on various ensemble performances, which are constructed in workshops led by the students and visiting tutors. In this module you will learn appropriate methods and techniques for research and documentation of performance practices in the field. Topics relating to fieldwork, ethical principles, participant observation, interview techniques, and fieldnote taking are covered. Key issues in epistemology and methodology for such research will be raised and discussed and will be informed by supporting literature. This module explores the documentation of performance practices, with a focus on writing. It introduces forms of documentation emerging from personal memory data, self observation + reflection, and the collection of data from external sources. Registers of writing and the role of writing in the creative process are examined. This module engages with aspects of planning and management for professional artist, Students learn about the development of business plans, effective communication and pitching strategies, stakeholder development and core skills for the creative industries, such as financial management and planning. This module provides a space to engage in the study of a topic/subject of their own choice. Students organise their tuition and the assessment mechanism in consultation with their course director. A broad range of existing modules from the various postgraduate offers at the Academy is also available for students to chose from. This module exposes students to scholarship and performance practices from a wide variety of music and dance and related disciplines, enabling students to broaden their perspectives on their own specialisation as well as experience presentations from scholars and performers in cognate disciplines. Students are expected to attend a minimum of five seminars from the various series offered in the Academy. This module provides an introduction into current media technologies as they are used in the fields of performing arts, creative arts therapies, and arts research; to develop essential skills and fluency in these technologies in order to use them competently, creatively, and effectively in one’s own specific discipline. In this module students will be provided with an overview of improvisation within the context of current dance and music practices. Students will be introduced to a range of aesthetic and technical approaches to improvisation. Students will attend a number of workshops in which music and dance faculty will demonstrate and explore improvisational processes and practices; they will also research improvisational processes with a view to integrating and applying this knowledge in their own practice. This module will ensure that students are educated in somatic practices that promote a healthy and mindful approach to movement. The continued development of an integrated mind/body approach will enable students to perform with greater efficiency and will minimize their risk of injury. This module provides an introduction to ritual studies as an inter-disciplinary discourse drawing on anthropology, sociology, religious studies, ethnomusicology, ethnochoreology, festive arts and performance studies. It introduces a number of ritual case studies including historical and cross-cultural examples, with an emphasis on Irish ritual practices. There are many challenges facing International students (culture shock, language shock and academic shock), and this module offers strategies for managing this experience and for providing a rich and engaging learning environment for such students. This module will raise students’ awareness of the academic support systems, cultures, and protocols within UL; provide students with information sourcing and management skills; and provide students with strategies for successful integration and learning in UL. This module has two parts. In the first part, students will study the history, theory and practice of Irish traditional music. Additionally, students will study and develop skills in vocational areas associated with the performance of traditional music in a contemporary context. As part of this module, students are introduced to key ideas, issues and current debates in arts management and cultural policy. There is an emphasis on the interpretation and engagement with cultural policy from the perspective of a practitioner, and its relation to funding applications. The development of effective funding application skills and grant writing are also covered in this module. The aim of this module is to continue the work of ‘Writing and the Documentation of Practice ‘ in exploring the creative process in artistic and academic work with a view towards investigating resonance, dissonance and synchronicity between method in one’s own performance practice and in the the investigation of one’s own specialist research project. Exploring the dynamic field of screendance and dance-film making, this module prepares students to work creatively towards the creation of short dance films. The module contextualizes dance-film within the context of contemporary dance and arts practices while investigating a range of aesthetic and technical approaches to creating a work. Students will be introduced to interdisciplinary aesthetic and technical approaches to improvisation and composition. They will be provided with a platform to engage in research/enquiry that is interdisciplinary in nature with a view to integrating and applying this knowledge in their own practice. Students will attend a number of workshops/lectures in which faculty will explore and present aspects of the processes involved in interdisciplinary practice. International students often face linguistic challenges and this module offers strategies for managing this experience and for providing a rich and engaging learning environment for such students. This module will focus in particular on academic writing for International students. The Final Performance for the MA Irish Traditional Music Performance is 40 minutes in duration and reflects the student’s main instrument of study. However, other instruments and performance practices are welcomed, as long at the balance is in favour of the programme of study. Examiners will assess the overall performance, considering issues of musicality, technique, creativity, originality, variety, preparedness, mood, among others.